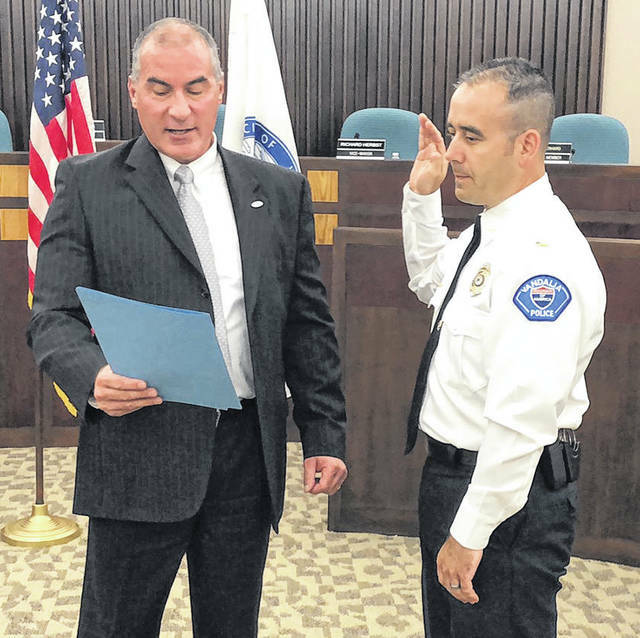 Vandalia City Manager Jon Crusey (left) administered the oath of office to Vandalia Police Lieutenant Ben Walker on Wednesday morning. VANDALIA — The Vandalia Division of Police elevated Sgt. Ben Walker to Lieutenant during a ceremony at the Municipal Building on Wednesday morning. City Manager Jon Crusey administered the oath of office. Walker, a graduate of Vandalia-Butler High School, has been with the Division of Police for 16 years. Prior to his service in Vandalia, he spent over four years in the Montgomery County Sheriff’s Office as a court services deputy and corrections officer. After joining the Vandalia Division of Police in 2002, Walker was promoted to Sergeant in 2009. Since then, he has filled a variety of assignments including patrol sergeant, detective sergeant, range supervisor, field training program supervisor, and administrative sergeant. Walker will serve as the department’s administrative lieutenant, an opening created when Kurt Althouse was promoted to Police Chief. As the administrative lieutenant, Walker will will oversee the department’s Records Section and Communications Center, recruitment and selection process, agency staff training programs, accreditation, and media relations. Walker lives in Vandalia with his wife Amanda and daughters Natalie and Hannah.